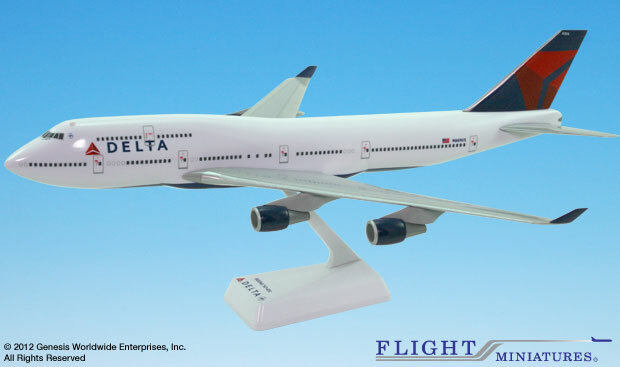 Flight Miniatures 1:200 Scale Plastic Snap-Fit – Boeing 747-400 – Length:13.75" Wingspan: 13"
After a 30-year hiatus, the Boeing 747 is back in the Delta fleet! In the early 1970s Delta operated a fleet of five 747-100s but found that this aircraft type was not suitable for use on its domestic routes and traded them all back to Boeing by 1977. Ironically, Northwest Airlines found the 747 to be an ideal aircraft for their international routes and was the launch customer for the Boeing 747-400. The merger with Northwest in 2008 introduced the 747 back into the Delta fleet. Now 16 of the Boeing 747-400s are operated by Delta, dedicated largely to trans-Pacific and intra-Asia flights to and from the Tokyo-Narita hub, including routes connecting Tokyo to Detroit, Honolulu, Manila, Minneapolis/St. Paul, New York-JFK and Shanghai. 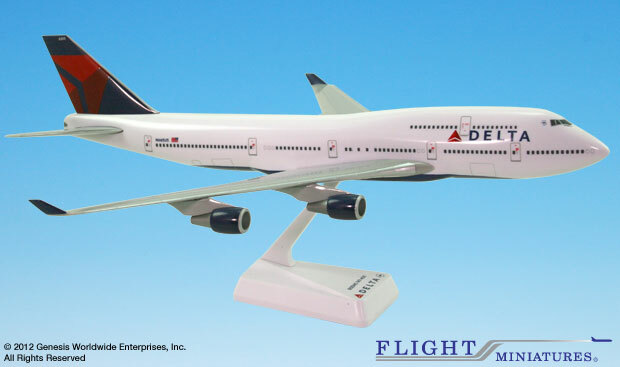 This model represents Ship 6305, the first of the Northwest Airlines Boeing 747-400s to be repainted in the Delta livery after the merger of Northwest and Delta.